A Covered Bridge is defined as a bridge in which the trusses, sides, and roofs are made of wood, creating a complete enclosure; they were built that way to protect the structural integrity of the bridge that, left exposed, would otherwise have a useful life of only 10-15 years. These Structures were built throughout the world during 19th century. In the United States, Philadelphia lays claim to the first bridge, built in the early 1800s, that spanned the Schuylkill River by 30th Street. 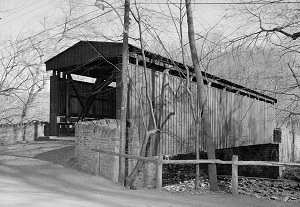 Eventually, nearly 12,000 covered bridges were in operation. By the 1950s, the hat number shrank to less than 1,500 as more affordable and durable materials came into existence. 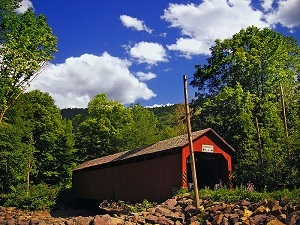 Early Timber covered bridges consisted of horizontal beams laid on top of piles driven into the riverbed below. This construction method meant that the length between bridge spans was limited by the maximum length of each beam; development of the timber truss circumvented that limitation and allowed bridges to span greater distances than those with beam-only structures of stone, masonry or timber arch structures. European Truss Bridges used king and queen post configurations. Some early German bridges included diagonal panel bracing in trusses with parallel top and bottom chords. Wood deterioration upon exposure to weather was addressed with various forms of coverings. Beginning around 1820, new designs were developed, such as burr, lattice and brown trusses. By mid-century, the introduction of wrought iron and cast iron led to metal rather than timber trusses, except in areas where large timber remained plentiful. Ask us about our anchor locations from which you can best base your travel movements, mindful that you are likely to visit three to four places in a compressed period of time, typically 7 to 10 days, and experience multiple interests that range from cultural to culinary, wellness and the environment.